Clarisse has designed simplicity to its finest with Style 2330 from their Spring 2014 Collection. The sweetheart neckline creates a sleek and clean look perfect for a pair of dazzling chandelier earrings or a sparkling necklace that will compliment this dress perfectly. The slimming black chiffon fabric is flirty and flattering for all body types. As for the lovely details on this Clarisse gown silver vine-like beading is added to the empire waist line for a sparkling way to slim the waist and accentuate the deep slit which reveals a beautiful silk black lining. These shining details give this gown timeless style that is sure to make you stand out from the rest of the crowd. Arrive at your next special occasion in a classy floor length gown that will have everyone admiring your sophisticated taste! 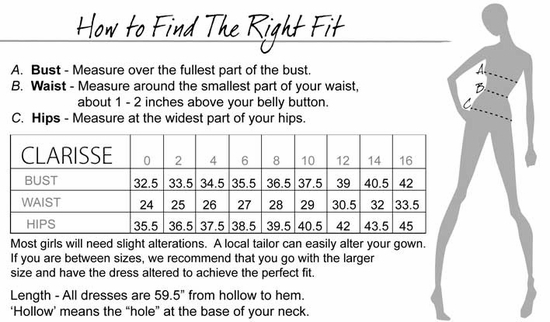 (By measuring your bust, waist and hips then clicking on the size chart tab next to this description you can find your perfect fit. Remember we are here to help you look amazing on your special night).